Will University of Texas AD’s Arrogance End 100+ Year Rivalry? Will Texas A&M Fire Football Coach Sherman? Texas A&M University was founded in 1876 as the first public institution of higher education in Texas. It was called Texas AMC. The University of Texas followed and was founded in 1883. For nearly a century, Texas A&M University was a military school out in the middle of the Texas countryside. A&M did not allow women and focused on sending thousands of military officers into battle, including several who received the Congressional Medal of Honor (this is where Aggies get the strong military traditions). The University of Texas, on the other hand, was placed in the Capitol of Texas, Austin, TX. The University of Texas was not a military school. It was in a big city, it was more modern, and so it became more popular. The Aggies and the Longhorns first began playing each other in 1894. They met for the 118th time on the football field this past Thursday November 24th, 2011. It might be the last time they meet. In the early years of the rivalry, the Longhorns certainly had the upper hand against the less modern, military school rival, and the Longhorns won most of these early games. Texas A&M would still win some of the games and they built historic football traditions along the way (like the 12th Man and even a 1939 National Championship). The rivalry got bigger and better with every year that passed. The Aggies would build an annual bonfire to burn the week before the Texas game. The Longhorns would have a Hex rally in the week before the Aggie game. Both schools mention this rivalry in their fight song. This game was the most important game every year for Texas A&M and Texas. In more modern times, Texas A&M became less of a military school as it transitioned into a regular university. A&M quickly became a big, modern University like the University of Texas. Add scholarship parity into the equation, and both schools became nearly even in everything from enrollment to academics and especially athletic program rankings. Today, both schools have around 50,000 students. Both schools have similar average SAT scores of new students. A&M has a top business school and UT has a top Law School. Both schools have multiple sports in the top 25 and both have sports with recent national championships. In the most recent Director’s Cup National Rankings of Overall Athletic Program Performance, A&M is ranked 8th and the Longhorns are ranked 12th. In this modern era, from 1975 to 2011, the football rivalry is nearly even. Texas A&M University has won 19 games and UT has won 18 games out of these last 37 games played. In one stretch in the 1980’s and 1990’s, A&M won 11 of 12 games played between the two teams. This was the time of A&M’s Wrecking Crew and the dominance that A&M had at home (KYLE FIELD). Then Mack Brown became the coach at the University of Texas and things turned around for the Longhorns. The Longhorns started to get back into the national scene again and they even won a National Championship on the back of their star quarterback Vince Young. This rivalry is heated, competitive and in this modern time, anyone can win the game in any given year. In modern times the rivalry is split nearly evenly down the middle in wins and losses. This year’s game is a perfect example. A&M lost the game in the way they have all season long. A&M had a second half meltdown filled with game costing mistakes. Even so, the game was neck and neck till a last-minute, questionable penalty gave UT a much needed first down that resulted in the game winning field goal for the longhorns. Could that be a reason why UT’s Athletic Director DeLoss Dodds does not want the rivalry to continue? Dodds and Texas Coach Mack Brown have been in the hot seat with the last couple of seasons being considered as failures for the University of Texas. Big college teams typically want their non conference schedule to be as easy as possible with maybe one competitive game against a good non-conference team. With the Aggies heading to the SEC, the Longhorns would have to give up one of their easy non conference games to keep playing the Aggies. The Aggies are up for the challenge and they want to keep the rivalry alive. Texas Athletic Director on the other hand has made the silly statement that the Longhorn schedule is “booked” until 2018 and they cannot play the Aggies. That of course is just an excuse because non conference games, especially against small schools, can be changed or rescheduled with relative ease. The Aggies are heading off to the SEC. They have every right to want to go to a conference that is looked upon as the best football conference in the nation. This could lead to many more perks than the Big 12 has to offer and more resources to build their football program back up. Texas A&M University is not going anywhere. It is still in Texas. Residents in Texas will now get to see some of the good SEC teams every year in College Station, TX. The Longhorns, on the other hand, are staying in the big 12 and are building their own television network. They have every right to do that too (within the NCAA guidelines of course). College football does not get money from tuition. It is its own business and has to keep building and creating sources of revenue. So the Aggies are going to a different conference and the Longhorns have their own network. Regardless of the Longhorn Network and Regardless of the Aggies going to the SEC, the Rivalry can and should go on. There are several big name Universities that meet every year to play their in-state rivalry even though the two teams are in different conferences. Make no question about it. The ball is in the Longhorn’s court right now. We can argue about how it all started and who did the most to hurt the rivalry, but right now, at the end of the day, most of the fans would still like to see the rivalry go on, there is big money in the game for the State of Texas, and the Aggie Athletic Director Bill Byrne says it can still be done. The only thing holding up the rivalry is the Longhorn Athletic Director DeLoss Dodds who says he will not do it. That is a shame and a horrible reason for this storied rivalry to end. Will Texas A&M University Fire Coach Sherman? The glory years of the 80’s and 90’s are gone, and for the last decade A&M football has been on a downslide away from their dominance of the 80’s and 90’s. A&M hired Coach Fran (Dennis Franchione) hoping that he would turn things around, but he only drove the program into the ground, barely getting above .500 over 5 seasons. Fran did beat the Longhorns in his last two seasons as head coach, but that was not good enough and he was shown the door. 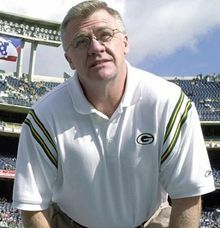 Coach Sherman, the great coach from the Green Bay packers, was ushered in to save the day. It is four years since Mike Sherman took over and he has been mediocre at best. He is in the hot seat and the question is not whether to fire him. The question is what is going to keep A&M from being able to fire their underperforming coach. Mike Sherman is now 25-25 in 4 seasons as the Head Football Coach at Texas A&M. This 2011 season will go down as one of the most disappointing seasons in Aggie History. The first two seasons in the Sherman era were not good, but he was a new coach so they gave him some time to get better. His third year, last year, was not good at first because of an injured quarterback that Sherman kept in the game. Sherman finally changed quarterbacks and A&M finished off the season in spectacular fashion. This year, Texas A&M was ranked in the top ten to begin the season. They had some of the best talent in college football and returned most of the players who were part of the Big 12 South Champion (tie) team that won 6 in a row last season against top teams like Oklahoma and Nebraska. Sherman, at most, could only lose a couple of games this season with the talent he had to work with. WRONG. Texas A&M lost 6 games including a loss to Texas (who also is an no performing up to standards this year). A&M would build up a large lead in the first half of these losses, but then they would lose the second half miserably. That would indicate bad second half adjustments. The quarterback did make un-timely interceptions in many of those losses, but still, the responsibility of winning games falls on the shoulders of the head coach who gets paid millions to win or to make whatever changes are necessary to win. It is unreasonable to think that a college team will never lose any games. On the other hand, having a record of 25-25 after 4 seasons is completely unacceptable, especially given the talent that A&M has been able to round up. There is controversy over whether Coach Sherman’s payout is around 2 million or closer to 9 million. Depending on the payout and depending on the bowl game score, Sherman might not make it another season. Many people even believe he should be fired immediately no matter what the cost. If A&M made the mistake of giving Sherman such a large buyout (9 million), and/or if Sherman wins this bowl game, then he will likely be back for another year. It is also possible that A&M wants to give him another year to see how he does in the SEC. Regardless of how things end up, this season will go down as one of the biggest failures given the amazing talent to work with. If Sherman gets another year, I really hope he will be successful. I do not wish for him to be bad because if Sherman is bad then that means A&M is losing. As for now, Sherman has been a failure, and he is in the hot seat. Very biased argument. Texas A&M has SUCKED at football for several decades now. I did not read any mention of Big 12 success from both programs. Why would A&M want to leave a conference in which it has won 1 conference title game in over 10 years for an even better conference? Can Texas A&M be accused of possessing the greatest inferiority complex in the history of the game? It seems as though they left to avoid the little brother stigma the program has possessed since its inception. Poor aggies? Why is exactly that UT' s athletic director is the arrogant one here? Aggie is the one who left the conference. So now UT is supposed to play the game for posterity or what? Texas A&M's administration is responsible for their departure, they were not forced out and multiple concessions were given to the B12 schools that A&M declined, and they are willing to pay an exit fee to leave. Thus they surely must have known that the UT game was at risk. As far a s your statistics, while the game wins and losses are equivalent since 1975, the game means more to A&M as they have only a pre-WWII football championship and are not considered a national power in football. In short, the game benefitted Aggie far more than it benefitted Longhorn. Then you tack on their departure and attempt to destabilize the Big12 and now they should have "their" UT game as well? Just forgive and forget, right? Well if they want the game, come back to the Big12, but they are too arrogant to do that. This historic rivalry has ended due to economics. The Longhorn Network, etc... has left a bad taste in everyone's eyes. But, I believe some exceptions will be made and I will not be surprised if a meeting between the two schools will come together. I'll start off by coming clean that I am a Longhorn. I'd like to say that I find some faults in your article. In it, you attempt to place all of the blame on the University of Texas and Deloss Dodds. I understand people want to place the blame on someone, but maybe, just maybe, some of the blame falls on Texas A&M? Yet, your article doesn't really discuss that at all. Sure, Texas COULD rearrange the schedule to play A&M next year, but why would they? A&M filed for divorce from Texas and the Big 12. When you file for divorce, you lose the right to come over for Thanksgiving dinner the following year. I could argue many other points about this article, but I will refrain. Instead, I will just say that there are two sides to every coin and this article only focuses on one side of the coin. Wow, that's a pretty one sided way of looking at it. First, no one cares that the farmer college opened a few years before the actual University of Texas (may take a little longer to get a true University accredited and up and running). If you go look you'll see that A&M was actually designated to be a branch of UT by the legislature. Obviously A&M is a great University now, but the way aggies act like they were first is so ridiculous. Second, while yes the aggies have won lots of games since 1975, how many championships of any kind have they won since 1975? Compared to UT there is still no comparison and I don't care what sport you want to talk about. Did the rivalry start 118 years ago or in 1975? Convenient to draw the line there isn't it? Also, how many years was A&M on probation during that 11 of 12 game stretch? The only year you finished in the top 5 you couldn't go to a bowl because of being on probation. Congrats! Finally, the rivalry is ending simply because A&M could not win in the big 12, got jealous of UT's network that A&M had a chance to be a part of originally, could not generate the dollars to compete with UT and OU (again because of not winning) and decided that they had to try something different. Those are the reasons plain and simple and they are the same for Nebraska who realized it couldn't dominate Texas like it dominated the Big 8. It isn't arrogance from Texas' AD and why should Texas reward A&M with a continued rivalry game and all the money it brings in (one of the few sell outs Kyle Field gets anymore) after A&M turns their back on a great rival and weakens our conference? I have to agree with DeLoss Dodds, we shouldn't. Oh and while you infer that Texas is scared to schedule a tough non-conference schedule, that's a total joke. A&M have been the masters of that (look at your 2009 and 2010 schedules) and if you took the time to look at our future schedules you would notice schools like USC and Notre Dame on there and it was not long ago that Texas played home and away with Ohio St. Sorry to get fired up but you sir are a maroon colored moron. hmm... if I recall correctly it was the University of Texas who first tried to leave the Big 12 to go to the PAC 10. They showed they did not care about the stability of the conference so when A&M saw a chance to go to a more stable conference they took it. Yes A&M has not been great in football lately. They have only one conference championship in the Big 12. Before that they beat Texas almost 10 times in a row so it is not like they have never been good in ercent history. It goes up and down. A&M will go back up and going to a better football conference will help them build. Sure, Texas won one national championship in recent years but in reality, can Texas be all that proud right now when they had a losing seasin last year and barely broke even this year? If you look at Bellow's blog tracker you will notice he has done probably over 100 political articles just this year, including one today about a black activist in East Texas posing as a DOJ official. I think he is entitled to one article that does not have to do with politics. Although, Football in Texas has EVERYTHING to do with politics! UT's network gave everyone problems. UT even wanted to break NCAA regulations and show high school football games. UT wanted A&M to pay half of the cost of the Network even though A&M would not get half back out of the network. UT was the team to try to leave the conference before A&M ever tried to. UT is the bad guy. A&M is doing good to go to greener pastures. The UT vs A&M game can and should go on. After all the pointing fingers, the decision not to play the game rests with the UT athletic Director. What is UT afraid of if all the Longhorn fans think A&M is such an easy team to beat?